Google is set to make it so people can make phone calls right from within a Hangout. It doesn’t matter whether it’s in Gmail or on the Web. In a tweet from the Gmail team, this new feature will be rolling out over the next couple of days and marks the return of calling to the company’s email service. In a post from Google’s Senior Software Engineer, Alex Wiesen, it’s apparent that the company has heard the cries from many users who found it disappointing they could no longer make calls right from within Gmail. Calls made to folks in the US and Canada are free from any country where Hangouts are available. Calls can also be made to places outside of North America. Through Google Voice, callers are charged a range from $0.02 per minute to India and up to $0.15 to those in Mexico. Users don’t need to make calls through Gmail. Google+ and the Chrome extension also support this feature. Google tells us that with Hangout calls, people can host conversations with up to 10 people — with up to 5 people by voice-only and up to 10 for video. Sound effects such as applause, laughter, and other tracks can be added to the call, most likely from the call organizer and powered through the Google Effects app. 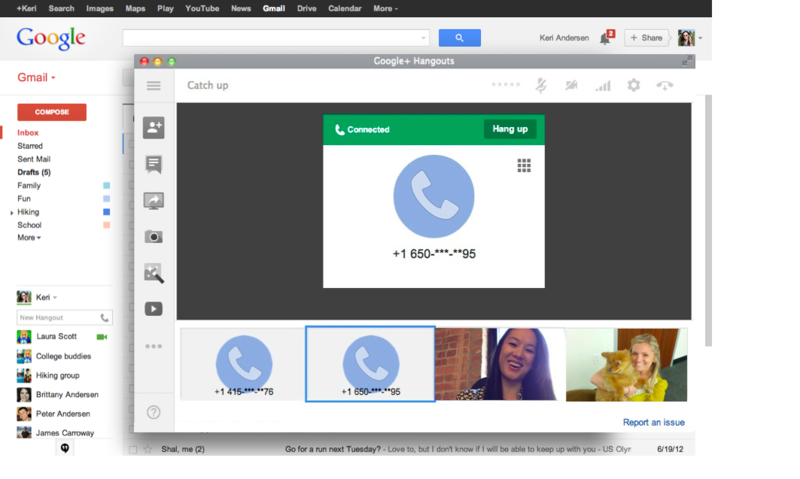 To initiate a call, users can tap on the phone icon in their Gmail chat box or go to the “Call a phone” menu item located in Google+ and the Chrome extension. The company says that bringing calls back to Google products is only just the beginning for the company. 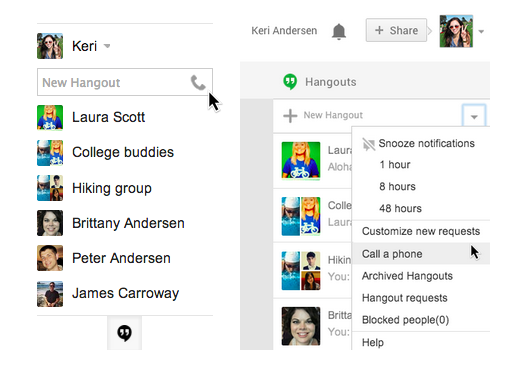 It has plans to further integrate Google Voice features into Hangouts in the future.